They may have plenty of lobsters, but the state of Maine is running out of dentists. And the shortage is so severe a free summer camp has been set up to get teens hooked on dentistry. 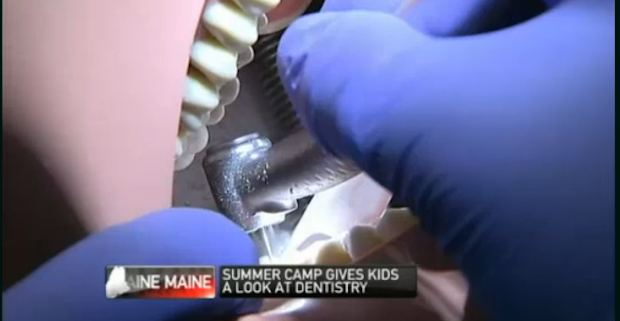 Dental Careers Exploration Camp in Portland is free to parents of the 13 teens who were selected to attend to learn more about career opportunities, reports NECN. The camp is designed to serve as a feeder system for the University of New England's new College of Dental Medicine. The need is real since the average age of a dentist in the state is 55, with one for every 2,000 residents. While their friends swim and hike, dental campers are learning to take x-rays, make teeth impressions, and suture gum tissue using raw chicken breasts. There's also plenty of drilling and filling. During the work, the dentists share what it's like to be a dental student. "Historically Northern New England - Maine, Vermont and New Hampshire - have had the lowest number of applicants to dental schools in the country," Dr. Jeffrey Doss, an oral surgeon and faculty member told NECN's Amy Sinclair in Portland. Among the skills required are biomedical science, good hand skills and a way with people. "It's a true art form to restore someone's mouth," Dr. Lionel Vachon, assistant dean for the college of medicine, told NECN. The problem of extreme dental shortages is not limited to Maine, as AOL Jobs has reported. According to The Health Resources and Services Administration, there are 48.7 million Americans who live in areas with dental-care shortages. Lawmakers in Kansas, New Mexico, and Vermont seek to create an entirely new kind of dental provider -- a "dental therapist" or "registered dental practitioner" -- who stands somewhere between dentist and dental hygienist. The new providers would be allowed to perform simple procedures, like filling cavities and extracting children's primary teeth.